The best betting sites for daily horse racing is Paddy Power! This is the most famous and large Irish bookmaker, which with its appearance in 1988, painted the gambling market in green and it’s not surprising, because this company brought the sportsbook to a new level, making it entertaining and sometimes even provocative – the Irish spirit is in everything here! The bookmaker was founded thanks to the merger of three chains of stores and now provides its services in about 350 retail outlets. Since 2005, the company has appeared online and become popular all over the world, today millions of customers betting along with this bookmaker in dozens of countries, and their annual revenue is approaching one billion Euros. Paddy Power is licensed and regulated by the Malta Gaming Authority for international players and, of course, licensed by the Gambling Commission for customers in the UK. Paddy Power is an innovative bookmaker that always keeps up with the times and offers the top quality service. A real landmark of this company are their endless promotions, characterized by great originality and generosity (they are just kings when it comes to Money-back special), as well as its aggressive marketing policy. Let us be honest, the advertisement of this bookmaker has always been attention-getting and so provocative, that often this bookie even got into the courtroom! Although, if you have a sense of humour, you will not see anything wrong with their advertising. Whether that is true or not, but we can safely say that Paddy Power is the most fun-loving bookmaker in the world! However, where the game begins, there the fun ends and you can count on the most serious approach to the betting from this company! Over the years on the market, PP has earned the reputation of a reliable and honest partner. Paddy Power site is a typical British product that has its own characteristics, but overall it looks familiar and customary, so an experienced player will immediately figure out what is what for here. It may be necessary for a beginner to take some time to get comfortable at this betting site. In general, the site is quick to load and understandable, but it can hardly be called intuitive – sometimes you will need some time to understand how to find the event or information you need. For example, when you click on ‘Football’ in the right column, you get to the page where there is no list of games and at the same time, in the right column there is no list of countries or leagues! You must admit this is a far stranger situation when you click on ‘Football betting’ and to see the list of the leagues, you will have to click again on ‘Football matches’. A lot of things are happening on the main page, so it may seem too crowded for you and it’s not easy to find what you need right away. The bookmaker placed everything on the main page! Think about it, apart from a large number of advertising and information blocks, there is an upper menu that provides access to the main sections of the website, a little lower there are two more menus that are auxiliary, with a left column with ‘quick links’, ‘AZ sport menu’, ‘site settings’, ‘help’ and ‘contact’. In addition, on the main page in the centre you will always find access to ‘football’, ‘matches’, ‘coupons’, ‘outrights’, ‘specials’, ‘teams’ and ‘virtual’. In a word, on the main page the site is just everything. Paddy Power betting coverage is just excellent! You can expect to find markets for almost all sports, this is one of the strongest sides of this bookmaker, maybe this betting site is slightly inferior to Bet365, but still among the best in this aspect. Apart from the 50 sports, of course, this company offers bets on politics, lotteries and TV shows and other entertainments, you can find here bets even on the weather for Christmas, in fact, PP chief specialist on the planet at unusual stakes! What’s more interesting, the bookie likes to pay the winnings as they wish! For example, you put on England to score and they scored, but the referee made a mistake and unfairly did not count this goal. In this case, PP can pay the winnings to all the players – who bet on England to score and who made a bet that England does not score. This is really hilarious bookie! The depth of the betting markets will satisfy all players, while it cannot be said that you will find here the same choice of markets as Bet365 or 10bet have, but you will get a huge number of unique bet types that you will not find anywhere else! Perhaps the main drawback is a very poor selection of Asian handicaps, even for the English Premier League match PP offers 2-3 Asian handicaps – this is not enough for such a popular bookie! On the other hand, if you like football statistics and are well versed in major leagues, and most importantly, like to risk, then Paddy Power markets will become a real godsend for you! The bookmaker offers a huge selection of complex bets, for example, ‘Each team to get 4 or more corners’; ‘Each team to have 2 or more corners in each half & each team score in each half’; ‘Team Win to Nil & Player X to score & over 8.5 corners’; ‘BTTS & 3+ corners for each team & 2+ cards for each team; Exactly 2 goals & exactly 10 corners & exactly 3 cards’; ‘Team 1st goal & Team 1st card & Team 1st corner & Team 1st throw in’; ‘Team Win to Nil & Player X to score & over 8.5 corners’; ‘BTTS & 4+ corners for each team & 3+ cards for each team’; etc. Odds on such outcomes are simply huge, you can bet at odds of 150 and greater! In general, if we talk about the main types of bets, then you can see about 80 markets for games in minor divisions and more than 150 markets for popular events. Of course, being an Irish bookmaker, PP is focused on football and pays great attention to the English and Irish leagues. Paddy Power odds are competitive and may be considered as average or higher. The value of the odds depends on the bet type, sport and league – the more popular tournament, than the higher odds. Overall betting margin is about 4.6%, and if you compare PP betting lines with the best in the market (on the top league football game, Win-Draw-Win), it will look like this: Paddy Power offers 2.10 – 3.30 – 3.65, and the best offer on the market at this moment will be 2.20 – 3.31 – 3.79. It is not such a big difference! Ironically, but the Irish bookie offers excellent prices for North American sports with the following margins: basketball – 4.4%, baseball – 4.4%, American football – 4.1%. As for the most popular sports, you can count on such payouts: football – 95.5%, tennis – 94.5% and ice hockey – 95.6%. Paddy Power Casino section are one of the best on the market, and you can enjoy Live roulette, blackjack, slots and others card or table games, provided by Playtech and IGT. Paddy Power betting limits will suit any player! Beginners can feel comfortable here, since the minimum bet is only ₤0.1, while the bookmaker uses the same limits for both singles and accas. The company does not limit the maximum stake, but limits the maximum winnings. As for the payouts, according to the official rules they are very high, although not always these amounts correspond to the real ones. Pay attention that the maximum accumulator payout will be equal to the amount of the minimum limit of one of the acca`s legs. As usual, the limits are set for sports, leagues and tournaments, depending on their popularity and how big the market is. The bookmaker is ready to pay £1,000,000 on main markets in tournaments such as Champions & Europe Leagues, English Premier League, Championship, Scottish Premier, Bundesliga, France Ligue 1 and Spain La Liga. For other leagues and minor divisions, limits are set: £50,000 for 1X2 markets and £10,000 for other bet types. If you are a fan of North American sports, you can expect to payouts up to £50,000. You can earn up to £200,000 on major tennis tournaments. As for the other sports and competitions, the limits vary from £10,000 to £50,000. 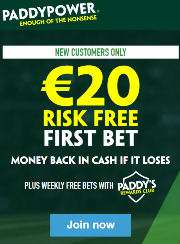 Paddy Power Live In-Play betting section will meet your expectations, because it corresponds to the overall bookmaker`s quality, although it can be noted that the pre-event betting lines look more convincing on this site. Some of the leading European bookies, such as Bet365 or Will Hill, sometimes offer even more extensive live markets than pre-match. The in-play section is quite simple to use, it is a fast loading page and you will not experience any problems here. The most popular events, which are now in action, you will see already on the main page of the website. For your convenience, the odds movement is highlighted, you can look at the teams or athletes statistics here, of course, there are info graphics, although it is inferior in its informativeness to the best bookmakers. One of the main advantages of Live In-Play betting section is live streaming, you can always find out which matches will be broadcast on the site in a ‘live calendar’, such events are marked with a special icon. Watching all the broadcasts is free, but to get access to the horse racing live streaming, you need to bet at least £1. You can watch several games on the same screen thanks to the ‘multiview’ function. As for the choice of markets, you can expect to find all the main bet types, and you will see from 80 to 100 markets on the most popular football games, this is quite enough for any player. The odds quality is on the average level, but sometimes it can reach a value higher than the market average. Overall, Paddy Power Live betting can be an excellent choice for you. Paddy Power promotions, bonuses and free bets you can always find in the respective section and believe us – there is always an endless list! £/€10 Risk Free first bet. Just make a deposit to your account and make a bet (€10 or more). Please note that all deposits, except via Moneybookers or Neteller, qualify for this promotion. If your bets lose, then you will get £/€10, and not as a free bet, but in cash to your account! Paddys Reward Club. This promotion is valid for new or existing customers. All you need to do within a week (between Monday at 00.01 and Sunday at 23.59) is place five bets of €10 at the odds of 1.50 or greater and the bookmaker will give you €10 as a free bet! Paddy Power payment section is not as diverse as other bookmakers have, but you can find here all the popular methods, and to be honest, you do not need more! The only drawback is the list of accepted currencies, because it is limited to EURO or GBP. The minimum deposit amount for all payment systems is €5, and the minimum withdrawal amount is also the same for any method – €10. Withdrawal time for Bank Wire, Visa, Visa Electron and Mastercard is 2-5 Days. The fastest method of withdrawal is e-wallets (PayPal, Laser, Neteller, Solo, Skrill), you will lose no more than 4 hours, although usually it takes one hour maximum. However, the maximum withdrawal is small – €2,500 per day. Do not forget that before the first withdrawal you must complete the verification procedure. Paddy Power customer service is one of the best on the market and available in all known ways! You will receive an answer to any question 24/7 by calling 00353 1 9050131 (for international users), 08000 565 275 (for UK clients) and 1800 238 888 (for customers from Ireland), the response time is up to 20 seconds. If the question is simple, then the easiest way is to get an answer on the website in Live chat (available only in English). Also you can leave a request on Twitter pages @AskPaddyPower. If your question requires an extended answer, we recommend sending an email (support@paddypower.com).